Wanna add a little hare-raisin' fun to yer Easter celebration? Riley Q. Cottonbottom is your guy. This two toned rabbit features a pink nose, wired ears and a turquoise gossemar neckbow that makes it easy as pie to blend in with the eggs for an Easter prank or two! Item #4013310 ~ $15.00 ~ 10"
This vintage cutie is a true blue America-lovin' bear! From the tip of his rust colored ears to the tip of his fabric-patched paw pads Patrick Henry is sure to inspire liberty in everyone he meets! Just check out the wooden sign he carries...inscripted with the word "Liberty", of course! Item #4013361 ~ $14.00 ~ 10"
Tutu! Tippy Knitbeary and her colorful giraffe Gigi are professionals when it comes to fun! Their bright pink, yellow and baby blue knits with beautiful rose accents make these two the most playful pair! 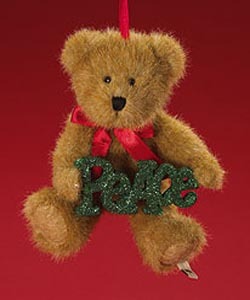 Somebeary is spreading a little peace this holiday season by carrying her very own glittering "Peace" resin attachment. There's always hope when you place Hope Sparklewish on your tree. This snow white ornament carries her own glittering "Hope" attached resin sentiment. 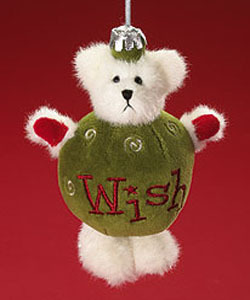 Miniature white bear is dressed in an ornament outfit complete with embroidered accents, rickrack embellishments and metallic ribbon hanger. 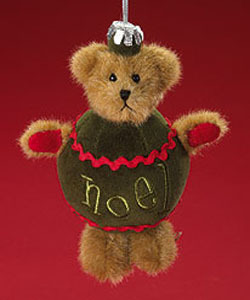 This golden bear is dressed in an ornament outfit that features embroidered accents, rickrack embellishments and metallic ribbon hanger. 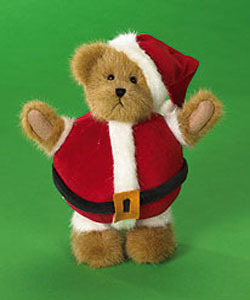 This jolly Santa is stuffed full of fun! Round lil' fella wears a self-dressed Santa suit and cap. Complete with cardboard inserts in feet for easy posing. 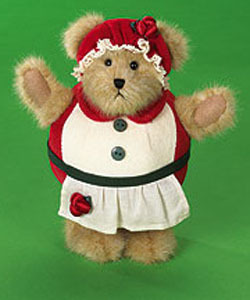 This Mrs. Claus is stuffled full of fun, right down to her ruffle-edge cap! Complete with cardboard inserts in feet for easy posing. This gift is a wrap! 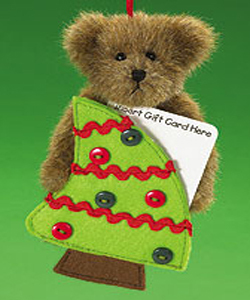 This minature bear couldn't look any cuter, nestled safely inside a fabric striped gift box, complete with green whip-stitched ribbon. Box features an oversized fabric bow, and felt gift tag features embroidered Christmas lights and "Making Spirits Bright" sentiment.